At Buttura & Gherardi Granite Artisans in Barre, Vermont, we begin our manufacturing process by selecting from the finest grades of quality memorial granites. 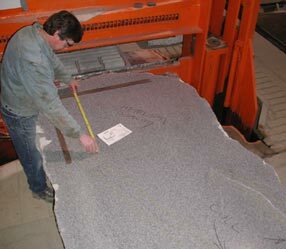 We select only the granite slabs that meet our high standards for your memorial. Most importantly, throughout the manufacturing process, extreme care is taken at every work station to inspect and ensure that everything is as perfect as natural stone allows. 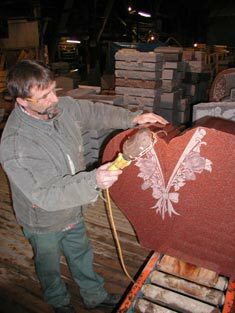 Each of our skilled craftsmen regards total quality control to be of paramount importance, and this is a large part of our company's sincere commitment to "Old World Craftsmanship." This was very much the work ethic of stone artisans in Italy one hundred years ago. Today, together with your Heirloom® retailer, we take pride in our Heirloom® and Artisan® memorial art products, as we share in our ancestors' values. We welcome the opportunity to serve you, because we know that each memorial is a lasting tribute to commemorate a special life, exactly as you wish - forever.